There is increasing revulsion among ordinary people in the U.S. against the political establishment. This came to a boil during the government shutdown in October. The anger is particularly directed at the Republicans, but there has also been widespread disillusionment with Obama and the Democrats. At the state level, Democrats like Mayor Rahm Emmanuel in Chicago have proven themselves to be just as dangerous to the interests of ordinary people as the Republicans. After five years of austerity and attacks on the rights of working people, millions are looking for a left alternative. 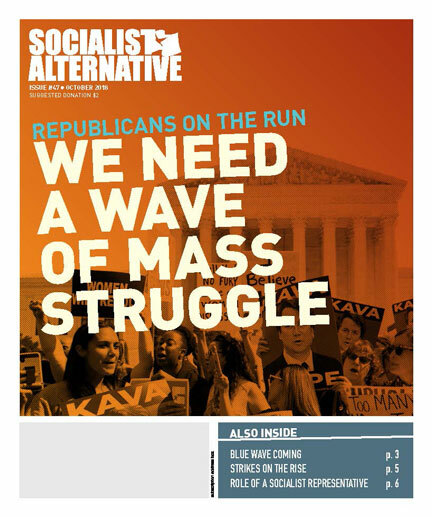 This is why the candidates of Socialist Alternative in Minneapolis and Seattle have received such enthusiastic support. But this anger is also fueling support for populist Democrats who appear to be taking on the establishment, especially where there is no credible left alternative to the two parties of big business. A very important example of this process is occurring in New York, where Bill de Blasio is poised to become the next mayor of New York City, the first Democrat to hold the position in 20 years. Since 2002, Michael Bloomberg has ruled the city as the direct representative of Wall Street. Bloomberg is truly one of their own; his personal wealth has grown from $5 billion to $27 billion during his time in office. De Blasio’s campaign emerged dramatically from a crowded primary field to overtake Bloomberg’s presumed successor, City Council Speaker Christine Quinn, who promised to continue his corporate-friendly policies. De Blasio’s main theme was “A tale of two cities,” and he talked explicitly about the vast inequality between rich and poor in the city. Government statistics have shown that almost half (46%) the population of New York City, the richest city in the world, is either poor or near poor. Much-needed hospitals are being shut down, and despite twelve years of corporate “education reform” the schools, especially in poor neighborhoods, are getting worse – not better. Meanwhile, police violence, surveillance, and racist stop and frisk tactics have become a way of life for black and Latino youth. The shift in popular consciousness in the city was seen in the widespread support for Occupy Wall Street two years ago. Nor will ordinary New Yorkers soon forget how the elite moved heaven and earth to turn the lights back on in the financial district in Lower Manhattan after the Sandy superstorm in 2012, while thousands of working and poor people were left to rot in darkened buildings where the water wouldn’t reach above the lower floors. De Blasio has promised to raise taxes on the rich to pay for universal pre-K, to massively curtail stop and frisk, and to stop favoring charter schools over public schools. In a distorted way, he has articulated the anger of the working class against Bloomberg and the rich elite. We sympathize with the reasons why people have hope in de Blasio, especially in the absence of a credible alternative to the left of the Democratic Party. There are clear differences between him and his Republican opponent, Joe Lhota, on a range of issues. But when push comes to shove, de Blasio in office will side with the 1% against the 99%. He will move to impose cuts and attacks on the living standards of working people and the poor rather than make the elite 1% shoulder the burden of the crisis that their policies have caused. He is supported by a section of the establishment, including financiers and real estate developers, many of whom think that a shift in political tactics is needed in order to avoid an explosion of anger from below along the lines we saw with Occupy Wall Street, or more recently in Turkey and Brazil. However, rattled by the experience with OWS, other sections of the establishment are warning that de Blasios rhetoric amounts to class warfare and that workers may take these promises at face value. They fear his populist message could open the door to mass struggle against Wall Street and the rich in this, the financial and cultural capital of the country. At the moment, de Blasio is the most prominent example of the populist phenomenon on the left wing of the Democratic Party. But he is not the only one. Another Democrat whose popularity has soared in the current environment is Elizabeth Warren, the new Democratic Senator from Massachusetts who is perceived as the party’s biggest critic of Wall Street. It is understandable why many will look to figures like de Blasio and Warren as a vehicle to push for a progressive agenda. However, previous experience shows this support will be used to repair the Democrats’ tarnished brand and to herd people back into the fold. This has been the role of “left” Democrats in the past. It is also striking that, despite semi-radical rhetoric, populists like de Blasio generally make very modest proposals. For example, while de Blasio had a great deal to say about income inequality in his campaign, he does not support a $15 minimum wage – or even a substantial increase – a very popular demand raised by the fast-food workers campaign and which would concretely contribute to the lowering of inequality. And even the modest demands raised by the populists will be mostly unachievable without social struggle. For example, even de Blasio’s call for a slight increase in taxation on the rich to pay for universal pre-K will require mobilizing ordinary people since the Democratic governor has made clear he opposes any tax increase! When asked to explain how this hurdle will be overcome, de Blasio is evasive. Social struggle is not part of what any wing of the Democratic Party argues for. It is only socialists and other genuine left activists who clearly argue that winning office is only meaningful in order to assist and give voice to a wider struggle for fundamental change. Ultimately, the Democrats are every bit as committed as the Republicans to the maintenance of the capitalist system, which is the source of the vast inequality and rising misery in our society. This party simply can’t be reformed into a progressive force. Working people and the poor and all those fighting oppression need to start running pro-worker, anti-corporate independent candidates as part of forming a new, genuine party of the left which will represent the interests of the 99%. The 1% have two parties; we need one of our own!